Oak bark has astringent, anti-inflammatory properties. It contains a large amount of tannins, flavonoids, antioxidants. Oak bark is an effective remedy for diarrhea. - 10 drops of Valerian. - 500 ml of boiled cold water. Oak bark has on the intestinal anti-microbial and anti-inflammatory effect, contributes to the consolidation of a chair. Once in the body, tannins interact with proteins and form a protective film that protects the digestive tract from the local irritation. Oak bark can help with diarrhea, gastrointestinal bleeding, poisoning, diseases of the spleen and liver. The tool helps with diarrhea caused by infectious diseases. The oak bark can be used even in babies (in the form of enemas). To prepare pour the dry oak bark and chamomile boiling water and leave in a thermos for half an hour. Warm, strain the infusion, add the Catnip and make an enema. For the treatment of diarrhea in adults, use an infusion of oak bark for oral administration. Pour dry oak bark with cold boiled water, leave for 9 hours and strain. Take the infusion of the bark during the day for 1-2 tsp, you Can do an enema. Diarrhea effective alcoholate in an old oak tree. For its preparation grind the raw materials, pour vodka or alcohol, leave to infuse for a week. Take the product twice a day 20 drops. 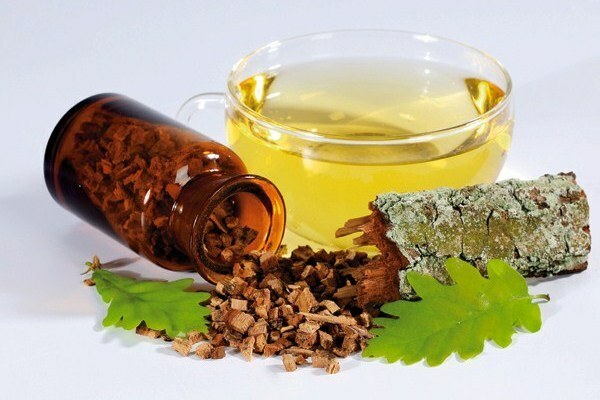 Tincture of oak bark alcohol not only helps to get rid of diarrhea, but also helps the intestines and other digestive organs. Chronic diarrhea cook of oak bark decoction. Add 1 tsp. of raw material in 300 ml of hot water and allow to boil on a slow fire for 10 minutes. Cool the broth and strain. Tool take 1 tablespoon three times a day. When severe diarrhea put 100 g of oak bark in 3 liters of hot water, boil for 30 minutes. Leave for half an hour, strain. Drink 1 glass of a decoction three times a day. This means you cannot take more than 3 days, otherwise you may see constipation. It is not recommended to use the oak bark for diarrhea with a tendency to constipation, hemorrhoids. Should not take decoction or infusion for a long time. Prior to using oak bark in the treatment of diarrhea caused by a serious gastrointestinal disease, you should consult with your doctor. Oak bark has no contraindications except hypersensitivity. However, during pregnancy and lactation is a tool used after medical consultation. Side effects include possible allergic reactions. The interaction of the means on the basis of oak bark with other drugs is not established.